Indicate by check mark whether the registrant has submitted electronically and posted on its corporate Web site, if any, every Interactive Data File required to be submitted and posted pursuant to Rule 405 of Regulation S-T during the preceding 12 months (or for such shorter period that the registrant was required to submit and post such files). Yes ¨ No ¨. Aggregate market value of 3,850,000 shares of registrants common stock held by non-affiliates of the registrant, based upon the closing price of a share of the registrants common stock on April 30, 2009 as reported by NYSE Arca on that date: $336,798,000. This Annual Report on Form 10-K contains forward-looking statements within the meaning of Section 27A of the Securities Act of 1933, as amended, and Section 21E of the Securities Exchange Act of 1934, as amended, and within the Private Securities Litigation Reform Act of 1995. These statements are predictions and actual events or results may differ materially from those expressed in our forward-looking statements. Risks and uncertainties may cause our actual results to differ materially from those expressed in our forward-looking statements. The value of the Shares relates directly to the value of the Swiss Francs held by the Trust and fluctuations in the price of the Swiss Francs could materially adversely affect an investment in the Shares. Readers are urged to review the Risk Factors section beginning on page 3 for a description of other risks and uncertainties that may affect an investment in the Shares. The discussion and analysis which follows may contain statement that relate to future events or future performance. In some cases, such forward-looking statements can be identified by terminology such as anticipate, expect, intend, plan, believe, seek, outlook and estimate as well as similar words and phrases that signify forward-looking statements. Neither the Sponsor nor any other person assumes responsibility for the accuracy or completeness of forward-looking statements. Further, these forward-looking statements are made as of the date of this report, and will not be revised or updated to reflect actual results or changes in the Sponsors expectations or predictions. The CurrencySharesSM Swiss Franc Trust (the Trust) is a grantor trust that was formed on June 8, 2006. The Shares commenced trading on the New York Stock Exchange (NYSE) under the ticker symbol FXF on June 26, 2006. The primary listing of the Shares was transferred to NYSE Arca on October 30, 2007. The Trust issues shares (the Shares) in blocks of 50,000 (a Basket) in exchange for deposits of Swiss Francs and distributes Swiss Francs in connection with the redemption of Baskets. The investment objective of the Trust is for the Shares to reflect the price of Swiss Franc plus accrued interest, if any, less the expenses of the Trusts operations. The Shares are intended to offer investors an opportunity to participate in the market for the Swiss Franc through an investment in securities. The Shares are intended to provide institutional and retail investors with a simple, cost-effective means of gaining investment benefits similar to those of holding the Swiss Franc. The Shares are bought and sold on NYSE Arca like any other exchange-listed security. The Shares are backed by the assets of the Trust, which does not hold or use derivative products. Investing in the Shares does not insulate the investor from certain risks, including price volatility. The value of the holdings of the Trust is reported on the Trusts website, www.currencyshares.com, each business day. The Trust holds Swiss Francs and, from time to time, issues Baskets in exchange for deposits of Swiss Francs and distributes Swiss Francs in connection with redemptions of Baskets. The Swiss Francs held by the Trust will be sold only (1) if needed to pay Trust expenses, (2) in the event the Trust terminates and liquidates its assets or (3) as otherwise required by law or regulation. The Sponsor of the Trust generally oversees the performance of the Trustee and the Trusts principal service providers, but does not exercise day-to-day oversight over the Trustee or the Trusts service providers. The Sponsor is Rydex Specialized Products LLC, a Delaware limited liability company. The Trusts only ordinary recurring expense is the Sponsors fee. The Sponsor is responsible for payment of the following administrative and marketing expenses of the Trust: the Trustees monthly fee, typical maintenance and transaction fees of the Depository, NYSE listing fees, NYSE Arca listing fees, printing and mailing costs, audit fees and expenses, up to $100,000 per annum in legal fees and expenses, and applicable license fees. The Sponsor also paid the costs of the Trusts organization and the costs of the initial sale of the Shares, including the applicable SEC registration fees. The Sponsors fee accrues daily at an annual nominal rate of 0.40% of the Swiss Francs in the Trust (including all unpaid interest but excluding unpaid fees, each as accrued through the immediately preceding day). The Sponsor was paid $1,460,691 for the year ended October 31, 2009. The Bank of New York Mellon, a banking corporation with trust powers organized under the laws of the State of New York, serves as the Trustee. The Trustee is responsible for the day-to-day administration of the Trust, including keeping the Trusts operational records. Rate) on each day that NYSE Arca is open for regular trading. If, on a particular evaluation day, the Closing Spot Rate has not been determined and announced by 6:00 PM (London time), then the most recent Closing Spot Rate is used to determine the NAV of the Trust unless the Trustee, in consultation with the Sponsor, determines that such price is inappropriate to use as the basis for such valuation. The Trustee also determines the NAV per Share, which equals the NAV of the Trust divided by the number of outstanding Shares. The NAV of the Trust and NAV per Share is published by the Sponsor on each day that NYSE Arca is open for regular trading and is posted on the Trusts website, www.currencyshares.com. JPMorgan Chase Bank, N.A., London Branch is the Depository. The Depository maintains two deposit accounts for the Trust, a primary deposit account which is expected to earn interest and a secondary deposit account which does not earn interest (collectively, the Deposit Accounts). Interest on the primary deposit account, if any, accrues daily and is paid monthly. If the Sponsor believes that the interest rate paid by the Depository is not competitive, the Sponsors recourse is to remove the Depository by terminating the Deposit Account Agreement and closing the accounts. The Depository is not paid a fee for its services to the Trust. The Depository may earn a spread or margin over the rate of interest it pays to the Trust on the Swiss Franc deposit balances. The secondary deposit account is used to account for interest received and paid out on creations and redemptions of Baskets. The secondary account is also used to account for interest, if any, earned on the primary deposit account, pay Trust expenses and distribute any excess interest to Shareholders on a monthly basis. In the event that the interest deposited exceeds the sum of the Sponsors fee for the prior month plus other Trust expenses, if any, then the Trustee will direct that the excess be converted into USD at a prevailing market rate and the Trustee will distribute the USD as promptly as practicable to Shareholders on a pro rata basis (in accordance with the number of Shares that they own). In certain exceptional cases the Trust may pay expenses in addition to the Sponsors fee. These exceptions include expenses not assumed by the Sponsor, taxes and governmental charges, expenses and costs of any extraordinary services performed by the Trustee or the Sponsor on behalf of the Trust or action taken by the Trustee or the Sponsor to protect the Trust or the interests of Shareholders, indemnification of the Sponsor under the Depositary Trust Agreement, and legal expenses in excess of $100,000 per year. The Trust will terminate upon the occurrence of any of the termination events listed in the Depositary Trust Agreement and will otherwise terminate on June 8, 2046. Each Share represents a proportional interest, based on the total number of Shares outstanding, in the Swiss Francs owned by the Trust, plus accrued and unpaid interest, if any, less accrued but unpaid expenses (both asset-based and non-asset based) of the Trust. All Shares are of the same class with equal rights and privileges. Each Share is transferable, is fully paid and non-assessable. The Shares are not a traditional investment. They are dissimilar from the shares of a corporation operating a business enterprise, with management and a board of directors. Trust Shareholders do not have rights normally associated with owning shares of a business corporation, including, for example, the right to bring oppression or derivative actions. Shareholders have only those rights explicitly set forth in the Depositary Trust Agreement. The Shares do not entitle their holders to any conversion or pre-emptive rights or, except as described herein, any redemption or distribution rights. Shareholders have no voting rights under the Depositary Trust Agreement, except in limited circumstances. If the holders of at least 25% of the Shares outstanding determine that the Trustee is in material breach of its obligations under the Depositary Trust Agreement, they may provide written notice to the Trustee (or require the Sponsor to do so) specifying the default and requiring the Trustee to cure such default. If the Trustee fails to cure such breach within 30 days after receipt of the notice, the Sponsor may remove the Trustee. The holders of at least 66-2/3% of the Shares outstanding may vote to remove the Trustee. The Trustee must terminate the Trust at the request of the holders of at least 75% of the outstanding Shares. The creation and redemption of Baskets requires the delivery to the Trust or the distribution by the Trust of the amount of Swiss Francs represented by the Baskets being created or redeemed. This amount is based on the combined NAV per Share of the number of Shares included in the Baskets being created or redeemed, determined on the day the order to create or redeem Baskets is accepted by the Trustee. Only Authorized Participants may place orders to create and redeem Baskets. An Authorized Participant is a Depository Trust Company participant that is a registered broker-dealer or other securities market participant, such as a bank or other financial institution that is not required to register as a broker-dealer to engage in securities transactions and has entered into a Participant Agreement with the Trustee. Before initiating a creation or redemption order, an Authorized Participant must have entered into a Participant Agreement with the Sponsor and the Trustee. The Participant Agreement provides the procedures for the creation and redemption of Baskets and for the delivery of Swiss Francs required for creations and redemptions. The Participant Agreements may be amended by the Trustee and the Sponsor. Authorized Participants pay a transaction fee of $500 to the Trustee for each order that they place to create or redeem one or more Baskets. Authorized Participants who make deposits with the Trust in exchange for Baskets receive no fees, commissions or other form of compensation or inducement of any kind from either the Sponsor or the Trust. No Authorized Participant has any obligation or responsibility to the Sponsor or the Trust to effect any sale or resale of Shares. The Sponsor, on behalf of the Trust, files quarterly and annual reports and other information with the SEC. The reports and other information can be accessed through the Trusts website at www.currencyshares.com. You should consider carefully the risks described below before making an investment decision. You should also refer to the other information included in this report, including the Trusts financial statements and the related notes. The value of the Shares relates directly to the value of the Swiss Francs held by the Trust. Fluctuations in the price of the Swiss Franc could materially and adversely affect the value of the Shares. Global or regional political, economic or financial events and situations. In addition, the Swiss Franc may not maintain its long-term value in terms of purchasing power in the future. When the price of the Swiss Franc declines, the Sponsor expects the price of a Share to decline as well. The USD/Swiss Franc exchange rate, like foreign exchange rates in general, can be volatile and difficult to predict. This volatility could materially and adversely affect the performance of the Shares. Foreign exchange rates are influenced by the factors identified immediately above and may also be influenced by: changing supply and demand for a particular currency; monetary policies of governments (including exchange control programs, restrictions on local exchanges or markets and limitations on foreign investment in a country or on investment by residents of a country in other countries); changes in balances of payments and trade; trade restrictions; and currency devaluations and revaluations. Also, governments from time to time intervene in the currency markets, directly and by regulation, in order to influence prices directly. These events and actions are unpredictable. The resulting volatility in the USD/Swiss Franc exchange rate could materially and adversely affect the performance of the Shares. If the Trustee is required to withdraw Swiss Francs from the Trust to pay expenses, this will reduce the amount of Swiss Francs represented by each Share on an ongoing basis and may result in adverse tax consequences for Shareholders. Each outstanding Share represents a fractional, undivided interest in the Swiss Francs held by the Trust. Recently, the amount of interest earned by the Trust has not exceeded the Trusts expenses; accordingly, the Trustee has been required to withdraw Swiss Francs from the Trust to pay these excess expenses As long as the amount of interest earned does not exceed expenses, the amount of Swiss Francs represented by each Share will gradually decline. This is true even if additional Shares are issued in exchange for additional deposits of Swiss Francs into the Trust, as the amount of Swiss Francs required to create Shares will proportionately reflect the amount of Swiss Francs represented by the Shares outstanding at the time of creation. As long as the Trusts expenses are greater than the amount of interest earned, the Shares will only maintain their original price if the price of the Swiss Franc increases. There is no guarantee that interest earned by the Trust in the future will exceed the Trusts expenses. The payment of expenses by the Trust will result in a taxable event to Shareholders. To the extent Trust expenses exceed interest paid to the Trust, a gain or loss may be recognized by Shareholders depending on the tax basis of the tendered Swiss Francs. The interest rate earned by the Trust, although competitive, may not be the best rate available. If the Sponsor determines that the interest rate is inadequate, then its sole recourse is to remove the Depository and terminate the Deposit Accounts. The Depository is committed to endeavor to pay a competitive interest rate on the balance of Swiss Franc in the primary deposit account of the Trust. Interest on the primary deposit account, if any, accrues daily and is paid monthly. The Depository may change the rate at which interest accrues based upon changes in the British Bank Association LIBOR Overnight rate for the Swiss Franc (BBA rate), other market conditions or the Depositorys liquidity needs. Although the Depository may consider the BBA rate in setting the interest rate, the rate paid to the Trust may be lower than the BBA rate. The Depository notifies the Sponsor of the interest rate applied each business day after the close of such business day. The Sponsor discloses the current interest rate on the Trusts website. If the Sponsor believes that the interest rate paid by the Depository is not adequate, the Sponsors sole recourse is to remove the Depository and terminate the Deposit Accounts. The Depository is not paid a fee for its services to the Trust; rather, it generates income or loss based on its ability to earn a spread or margin over the interest it pays to the Trust by using the Trusts Swiss Franc to make loans or in other banking operations. For these reasons, you should not expect that the Trust will be paid the best available interest rate at any time or over time. If the Trust incurs expenses in USD, the Trust is required to sell Swiss Francs to pay these expenses. The sale of the Trusts Swiss Francs to pay expenses in USD at a time of low Swiss Franc prices could adversely affect the value of the Shares. The Trustee will sell Swiss Francs held by the Trust to pay any Trust expenses incurred in USD, irrespective of then-current Swiss Francs prices. The Trust is not actively managed and no attempt will be made to buy or sell Swiss Franc to protect against or to take advantage of fluctuations in the price of Swiss Francs. Consequently, the Trusts Swiss Francs may be sold at a time when the Swiss Franc price is low, resulting in a negative effect on the value of the Shares. The Deposit Accounts are not entitled to payment at any office of JPMorgan Chase Bank, N.A. located in the United States. The federal laws of the United States prohibit banks located in the United States from paying interest on unrestricted demand deposit accounts. Therefore, payments out of the Deposit Accounts will be payable only at the London branch of JPMorgan Chase Bank, N.A., located in England. The Trustee will not be entitled to demand payment of these accounts at any office of JPMorgan Chase Bank, N.A. that is located in the United States. JPMorgan Chase Bank, N.A. will not be required to repay the deposit if its London branch cannot repay the deposit due to an act of war, insurrection or civil strife or an action by a foreign government or instrumentality (whether de jure or de facto) in England. Shareholders do not have the protections associated with ownership of a demand deposit account insured in the United States by the Federal Deposit Insurance Corporation nor the full protection provided for bank deposits under English law. Neither the Shares nor the Deposit Accounts and the Swiss Francs deposited in them are a deposit insured against loss by the FDIC or any other federal agency. Deposits may have only limited protection under the Financial Services Compensation Scheme of England. If the Depository becomes insolvent, its assets might not be adequate to satisfy a claim by the Trust or any Authorized Participant. In addition, in the event of the insolvency of the Depository or the U.S. bank of which it is a branch, there may be a delay and costs incurred in recovering the Swiss Francs held in the Deposit Accounts. Swiss Francs deposited in the Deposit Accounts by an Authorized Participant are commingled with Swiss Francs deposited by other Authorized Participants and are held by the Depository in either the primary deposit account or the secondary deposit account of the Trust. Swiss Francs held in the Deposit Accounts is not be segregated from the Depositorys other assets. The Trust has no proprietary rights in or to any specific Swiss Francs held by the Depository and will be an unsecured creditor of the Depository with respect to the Swiss Francs held in the Deposit Accounts in the event of the insolvency of the Depository or the U.S. bank of which it is a branch. In the event the Depository or the U.S. bank of which it is a branch becomes insolvent, the Depositorys assets might not be adequate to satisfy a claim by the Trust or any Authorized Participant for the amount of Swiss Francs deposited by the Trust or the Authorized Participant and, in such event, the Trust and any Authorized Participant will generally have no right in or to assets other than those of the Depository. In the case of insolvency of the Depository or JPMorgan Chase Bank, N.A., the U.S. bank of which the Depository is a branch, a liquidator may seek to freeze access to the Swiss Francs held in all accounts by the Depository, including the Deposit Accounts. The Trust and the Authorized Participants could incur expenses and delays in connection with asserting their claims. These problems would be exacerbated by the fact that the Deposit Accounts are not be held in the U.S. but instead held at the London branch of a U.S. national bank, where they are subject to English insolvency law. Further, under U.S. law, in the case of the insolvency of JPMorgan Chase Bank, N.A., the claims of creditors in respect of accounts (such as the Trusts Deposit Accounts) that are maintained with an overseas branch of JPMorgan Chase Bank, N.A. will be subordinate to claims of creditors in respect of accounts maintained with JPMorgan Chase Bank, N.A. in the U.S., greatly increasing the risk that the Trust and the Trusts beneficiaries would suffer a loss. Shareholders do not have the protections associated with ownership of shares in an investment company registered under the Investment Company Act of 1940. The Investment Company Act is designed to protect investors by preventing: insiders from managing investment companies to their benefit and to the detriment of public investors; the issuance of securities having inequitable or discriminatory provisions; the management of investment companies by irresponsible persons; the use of unsound or misleading methods of computing earnings and asset value; changes in the character of investment companies without the consent of investors; and investment companies from engaging in excessive leveraging. To accomplish these ends, the Investment Company Act requires the safekeeping and proper valuation of fund assets, restricts greatly transactions with affiliates, limits leveraging, and imposes governance requirements as a check on fund management. The Trust is not registered as an investment company under the Investment Company Act and is not required to register under that act. Consequently, Shareholders do not have the regulatory protections afforded to investors in registered investment companies. Shareholders do not have the rights enjoyed by investors in certain other financial instruments. As interests in a grantor trust, the Shares have none of the statutory rights normally associated with the ownership of shares of a business corporation, including, for example, the right to bring oppression or derivative actions. Apart from the rights afforded to them by federal and state securities laws, Shareholders have only those rights relative to the Trust, the Trust property and the Shares that are set forth in the Depositary Trust Agreement. In this connection, the Shareholders have limited voting and distribution rights. They do not have the right to elect directors. See Business  The Shares  Limited Rights for a description of the limited rights of the Shareholders. The Shares may trade at a price which is at, above, or below the NAV per Share. The NAV per Share fluctuates with changes in the market value of the Trusts assets. The market price of Shares can be expected to fluctuate in accordance with changes in the NAV per Share, but also in response to market supply and demand. As a result, the Shares might trade at prices at, above or below the NAV per Share. The Depository owes no fiduciary duties to the Trust or the Shareholders, is not required to act in their best interest and could resign or be removed by the Sponsor, which would trigger early termination of the Trust. The Depository is not a trustee for the Trust or the Shareholders. As stated above, the Depository is not obligated to maximize the interest rate paid to the Trust. In addition, the Depository has no duty to continue to act as the depository of the Trust. The Depository can terminate its role as depository for any reason whatsoever upon 90 days notice to the Trust. Such a termination might result, for example, if the Sponsor determines that the interest rate paid by the Depository is inadequate. In the event that the Depository was to resign or be removed, the Trust will be terminated. Shareholders may incur significant fees upon the termination of the Trust. The occurrence of any one of several events would either require the Trust to terminate or permit the Sponsor to terminate the Trust. For example, if the Depository were to resign or be removed, then the Sponsor would be required to terminate the Trust. Shareholders tendering their Shares within 90 days of the Trusts termination will receive the amount of Swiss Francs represented by their Shares. Shareholders may incur significant fees if they choose to convert the Swiss Francs they receive to U.S. Dollars. If Switzerland adopts the euro as its currency, Shareholders may be unable to sell their Shares and may lose money on their investment. Furthermore, if Switzerland adopts the euro as its currency, then the Trust will terminate upon the Council of the European Union adopting an irrevocable conversion rate of Swiss Francs to euro. If this occurs, Shareholders may lose money on their investment. European Union adopting an irrevocable conversion rate of Swiss Francs to euro. If the Trust terminates, it may liquidate at a time disadvantageous to Shareholders, such as when the price of the Swiss Franc has declined below the price prevailing when Shareholders purchased their Shares. Redemption orders are subject to rejection by the Trustee under certain circumstances. The Trustee will reject a redemption order if the order is not in proper form as described in the Participant Agreement or if the fulfillment of the order, in the opinion of its counsel, might be unlawful. Any such rejection could adversely affect a redeeming Shareholder. For example, the resulting delay would adversely affect the value of the Shareholders redemption distribution if the NAV were to decline during the delay. In accordance with the Depositary Trust Agreement, the Sponsor and the Trustee disclaim any liability for any loss or damage that may result from any such rejection. Substantial sales of Swiss Franc by the official sector could adversely affect an investment in the Shares. The official sector consists of central banks, other governmental agencies and multi-lateral institutions that buy, sell and hold Swiss Francs as part of their reserve assets. The official sector holds a significant amount of Swiss Francs that can be mobilized in the open market. In the event that future economic, political or social conditions or pressures require members of the official sector to sell their Swiss Franc simultaneously or in an uncoordinated manner, the demand for Swiss Francs might not be sufficient to accommodate the sudden increase in the supply of Swiss Francs to the market. Consequently, the price of the Swiss Francs could decline, which would adversely affect an investment in the Shares. Shareholders that are not Authorized Participants may only purchase or sell their Shares in secondary trading markets. Only Authorized Participants may create or redeem Baskets of Shares through the Trust. All other investors that desire to purchase or sell Shares must do so through the NYSE Arca or in other markets, if any, in which the Shares are traded. The liability of the Sponsor and the Trustee under the Depositary Trust Agreement is limited and, except as set forth in the Depositary Trust Agreement, they are not obligated to prosecute any action, suit or other proceeding in respect of any Trust property. The Depositary Trust Agreement provides that neither the Sponsor nor the Trustee assumes any obligation or is subject to any liability under the Trust Agreement to any Shareholder, except that they each agree to perform their respective obligations specifically set forth in the Depositary Trust Agreement without negligence or bad faith. Additionally, neither the Sponsor nor the Trustee is obligated to, although each may in its respective discretion, prosecute any action, suit or other proceeding in respect of any Trust property. The Depositary Trust Agreement does not confer upon Shareholders the right to prosecute any such action, suit or other proceeding. The Depositary Trust Agreement may be amended to the detriment of Shareholders without their consent. The Sponsor and the Trustee may amend most provisions (other than those addressing core economic rights) of the Depositary Trust Agreement without the consent of any Shareholder. Such an amendment could impose or increase fees or charges borne by the Shareholders. Any amendment that increases fees or charges (other than taxes and other governmental charges, registration fees or other expenses), or that otherwise prejudices any substantial existing rights of Shareholders, will not become effective until 30 days after written notice is given to Shareholders. The License Agreement with The Bank of New York Mellon may be terminated by The Bank of New York Mellon in the event of a material breach. Termination of the License Agreement might lead to early termination and liquidation of the Trust. terminated and one or more of BNY Mellons patent applications issue as patents, then BNY Mellon may claim that the operation of the Trust violates its patent or patents and seek an injunction forcing the Trust to cease operation and the Shares to cease trading. In that case, the Trust might be forced to terminate and liquidate, which would adversely affect Shareholders. The principal offices of the Sponsor and the Trust are at 9601 Blackwell Road, Suite 500, Rockville, Maryland 20850 which is leased by an affiliate of the Sponsor. Neither the Sponsor nor the Trust owns or leases any other property. The number of record holders of Shares of the registrant as of November 30, 2009 was approximately 123. Following are financial highlights for the fiscal years ended October 31, 2009, October 31, 2008, October 31, 2007 and the period from June 8, 2006 (date of inception) to October 31, 2006. As of October 31, 2009, total assets were $369,716,518 and for the fiscal year ended October 31, 2009, net cash flows were $(97,286,309). The investment objective of the Trust is for the Shares to reflect the price of the Swiss Franc plus accrued interest, less the expenses of the Trusts operations. The Shares are intended to provide institutional and retail investors with a simple, cost-effective means of gaining investment benefits similar to those of holding Swiss Francs. Each outstanding Share represents a proportional interest in the Swiss Francs held by the Trust. 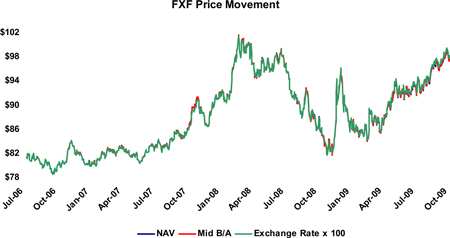 The following chart provides recent trends on the price of the Swiss Franc. 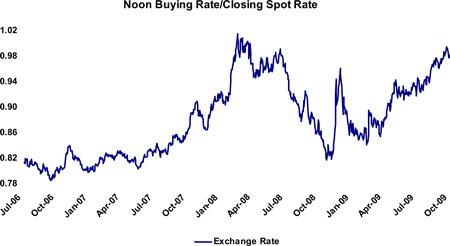 The chart illustrates movements in the price of the Swiss Franc in USD and is based on the Noon Buying Rate (prior to November 13, 2008) and the Closing Spot Rate (as of and after November 13, 2008). In exchange for a fee, the Sponsor bears most of the expense incurred by the Trust. As a result, the only ordinary expense of the Trust during the periods covered by this report was the Sponsors fee. Each month the Depository deposits into the secondary deposit account accrued but unpaid interest, if any, and the Trustee withdraws Swiss Franc from the secondary deposit account to pay the accrued Sponsors fee for the previous month plus other Trust expenses, if any. When the interest deposited, if any, exceeds the sum of the Sponsors fee for the prior month plus other Trust expenses if any, then the Trustee converts the excess into USD at a prevailing market rate and distributes the USD as promptly as practicable to Shareholders on a pro rata basis (in accordance with the number of Shares that they own). The Trust did not make any distributions during the quarter ended October 31, 2009. The functional currency of the Trust is the Swiss Franc in accordance with FASB Accounting Standards Codification (ASC) 830, Foreign Currency Translation. As of October 31, 2008, the number of Swiss Francs owned by the Trust was 545,000,000 resulting in a redeemable capital share value of $467,489,087. During the year ended October 31, 2009, an additional 350,000 shares were created in exchange for 34,928,066 Swiss Francs and 2,000,000 shares were redeemed in exchange for 199,845,809 Swiss Francs. In addition, 1,400,114 Swiss Francs were withdrawn to pay the portion of the Sponsors fee that exceeded the interest earned. As of October 31, 2009, the number of Swiss Francs owned by the Trust was 378,682,143 resulting in a redeemable capital share value of $369,593,706. A decrease in the Trusts redeemable capital share value from $467,489,087 at October 31, 2008 to $369,593,706 at October 31, 2009, was primarily the result of a decrease in the Shares outstanding from 5,450,000 at October 31, 2008 to 3,800,000 at October 31, 2009. The decrease in redeemable capital share value during the year ended October 31, 2009 was partially offset by an increase in the Closing Spot Rate which rose from 0.8570 at October 31, 2008 to 0.9763 at October 31, 2009. The Trusts net loss for the year ended October 31, 2009 was $(1,383,744) as a consequence of the Trusts Sponsors fee of $1,460,691 exceeding the interest income of $76,947. The Sponsors fee accrues daily at an annual nominal rate of 0.40% of the Swiss Francs in the Trust. Due primarily to a decrease in the weighted-average Swiss Francs in the Trust, the Sponsors fee decreased from $1,677,948 for the year ended October 31, 2008 to $1,460,691 for the year ended October 31, 2009. The only expense of the Trust during the year ended October 31, 2009 was the Sponsors fee. Interest income decreased from $6,839,514 for the year ended October 31, 2008 to $76,947 for the year ended October 31, 2009, attributable primarily to a decrease in the annual nominal interest rate paid by the Depository, which decreased from 0.68% at October 31, 2008 to 0.00% at October 31, 2009. Cash dividends per Share decreased from $1.15 for the year ended October 31, 2008 to $0.11 per Share for the year ended October 31, 2009. This decrease in cash dividends per Share was primarily the result of a decrease in the annual nominal interest rate paid by the Depository. See Index to Financial Statements on page F-1 for a list of the financial statements being filed with this report. The chief executive officer and chief financial officer of the Sponsor have evaluated the effectiveness of the Trusts disclosure controls and procedures (as defined in Rule 13a-15(e) and Rule 15d-15(e) under the Securities Exchange Act of 1934, as amended (the Exchange Act)) as of October 31, 2009. Based on that evaluation, the chief executive officer and chief financial officer of the Sponsor have concluded that the disclosure controls and procedures of the Trust were effective as of the end of the period covered by this annual report. The Sponsors management is responsible for establishing and maintaining adequate internal control over financial reporting, as defined under Rules 13a-15(f) and 15d-15(f) of the Exchange Act. The Trusts internal control over financial reporting is based on criteria established in Internal Control  Integrated Framework issued by the Committee of Sponsoring Organizations of the Treadway Commission (COSO), and is designed to provide reasonable assurance regarding the reliability of financial reporting and the preparation of financial statements for external purposes in accordance with accounting principles generally accepted in the United States. Internal control over financial reporting includes those policies and procedures that: (1) pertain to the maintenance of records that, in reasonable detail, accurately and fairly reflect the transactions and dispositions of the Trusts assets; (2) provide reasonable assurance that transactions are recorded as necessary to permit preparation of financial statements in accordance with generally accepted accounting principles, and that the Trusts receipts and expenditures are being made only in accordance with appropriate authorizations; and (3) provide reasonable assurance regarding prevention or timely detection of unauthorized acquisition, use, or disposition of the trusts assets that could have a material effect on the financial statements. Because of its inherent limitations, internal control over financial reporting may not prevent or detect misstatements. Also, projections of any evaluation of effectiveness to future periods are subject to the risk that controls may become ineffective because of changes in conditions, or that the degree of compliance with policies or procedures may deteriorate. The chief executive officer and chief financial officer of the Sponsor have assessed the effectiveness of the Trusts internal control over financial reporting as of October 31, 2009. Their assessment included an evaluation of the design of the Trusts internal control over financial reporting and testing of the operation effectiveness of its internal controls over financial reporting. Based on their assessment and those criteria, the chief executive officer and chief financial officer of the Sponsor believe that the Trust maintained effective internal control over financial reporting as of October 31, 2009. Effectiveness of the Trusts internal control over financial reporting as of October 31, 2009 has been audited by PricewaterhouseCoopers LLP, an independent registered public accounting firm, as stated in their report included herein. See Index to Financial Statements on Page F-1 for a list of the financial statements being filed as a part of this report. Schedules have been omitted since they are either not required, not applicable or the information has otherwise been included. 3.1 Certificate of Formation of Rydex Specialized Products LLC, incorporated herein by reference to Exhibit 3.1 filed with Amendment No. 1 to Form S-1 Registration Statement (File number 333-132364) filed on June 9, 2006. 3.2 Limited Liability Company Agreement of Rydex Specialized Products, LLC, incorporated herein by reference to Exhibit 3.2 filed with Amendment No. 1 to Form S-1 Registration Statement (File number 333-132364) filed on June 9, 2006. 4.1 Form of Depositary Trust Agreement, incorporated herein by reference to Exhibit 4.1 filed with Amendment No. 1 to Form S-1 Registration Statement (File number 333-132364) filed on June 9, 2006. 4.2 Form of Participant Agreement, incorporated herein by reference to Exhibit 4.2 filed with Amendment No. 1 to Form S-1 Registration Statement (File number 333-132364) filed on June 9, 2006. 10.1 Form of Deposit Account Agreement, incorporated herein by reference to Exhibit 10.1 filed with Amendment No. 1 to Form S-1 Registration Statement (File number 333-132364) filed on June 9, 2006. 10.2 Form of Sublicense Agreement, incorporated herein by reference to Exhibit 10.2 filed with Amendment No. 1 to Form S-1 Registration Statement (File number 333-132364) filed on June 9, 2006. In our opinion, the accompanying statements of financial condition and the related statements of income and comprehensive income, of changes in shareholders equity and of cash flows present fairly, in all material respects, the financial position of CurrencySharesSM Swiss Franc Trust (the Trust) at October 31, 2009 and October 31, 2008, and the results of its operations and its cash flows for each of the three years in the period ended October 31, 2009 in conformity with accounting principles generally accepted in the United States of America. Also in our opinion, the Trust maintained, in all material respects, effective internal control over financial reporting as of October 31, 2009, based on criteria established in Internal ControlIntegrated Framework issued by the Committee of Sponsoring Organizations of the Treadway Commission (COSO). The Trusts management is responsible for these financial statements, for maintaining effective internal control over financial reporting and for its assessment of the effectiveness of internal control over financial reporting, included in managements report on internal control over financial reporting appearing under Item 9A. Our responsibility is to express opinions on these financial statements and on the Trusts internal control over financial reporting based on our integrated audits. We conducted our audits in accordance with the standards of the Public Company Accounting Oversight Board (United States). Those standards require that we plan and perform the audits to obtain reasonable assurance about whether the financial statements are free of material misstatement and whether effective internal control over financial reporting was maintained in all material respects. Our audits of the financial statements included examining, on a test basis, evidence supporting the amounts and disclosures in the financial statements, assessing the accounting principles used and significant estimates made by management, and evaluating the overall financial statement presentation. Our audit of internal control over financial reporting included obtaining an understanding of internal control over financial reporting, assessing the risk that a material weakness exists, and testing and evaluating the design and operating effectiveness of internal control based on the assessed risk. Our audits also included performing such other procedures as we considered necessary in the circumstances. We believe that our audits provide a reasonable basis for our opinions. The CurrencySharesSM Swiss Franc Trust (the Trust) was formed under the laws of the State of New York on June 8, 2006 when Rydex Specialized Products LLC d/b/a Rydex Investments (the Sponsor) deposited 100 Swiss Franc in the Trusts primary deposit account held by JPMorgan Chase Bank, N.A., London Branch (the Depository). The Sponsor is a Delaware limited liability company whose sole member is PADCO Advisors II, Inc. (also d/b/a Rydex Investments). The Sponsor is responsible for, among other things, overseeing the performance of The Bank of New York Mellon (the Trustee) and the Trusts principal service providers, including the preparation of financial statements. The Trustee is responsible for the day-to-day administration of the Trust. The investment objective of the Trust is for the Trusts shares (the Shares) to reflect the price of the Swiss Franc plus accrued interest less the Trusts expenses and liabilities. The Shares are intended to provide investors with a simple, cost-effective means of gaining investment benefits similar to those of holding Swiss Francs. The Trusts assets primarily consist of Swiss Francs on demand deposit in two deposit accounts maintained by the Depository: a primary deposit account which is expected to earn interest and a secondary deposit account which does not earn interest. The secondary deposit account is used to account for interest received and paid out on creations and redemptions of blocks of 50,000 Shares (Baskets). The secondary account is also used to account for interest earned, if any, on the primary deposit account, pay Trust expenses and distribute any excess interest to holders of Shares (Shareholders) on a monthly basis. The accompanying audited financial statements were prepared in accordance with accounting principles generally accepted in the United States of America. The preparation of financial statements in conformity with accounting principles generally accepted in the United States of America requires management to make estimates and assumptions that affect the reported amounts of the assets, liabilities and disclosures of contingent liabilities at the date of the financial statements, the reported amounts of revenue and expenses during the period and the evaluation of subsequent events through January 14, 2010, the issuance of the financials statements. Actual results could differ from those estimates. The Trustee calculates the Trusts net asset value (NAV) each business day, as described in Note 4. 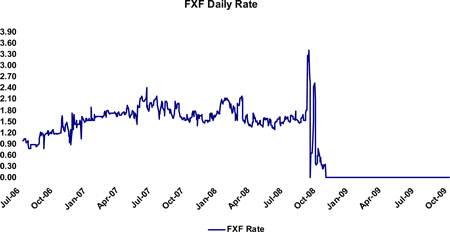 Prior to November 13, 2008, Swiss Franc Deposits (cash) were translated for NAV calculation purposes at the Noon Buying Rate, which is the U.S. Dollar (USD)/Swiss Franc exchange rate as determined and published by the Federal Reserve Bank of New York as of 12:00 PM (New York time) on each day that NYSE Arca is open for regular trading. As of and after November 13, 2008, Swiss Franc Deposits (cash) are translated for NAV calculation purposes at the Closing Spot Rate, which is the USD/Swiss Franc exchange rate as determined by WM/Reuters at 4:00 PM (London time) on each day that NYSE Arca is open for regular trading. The functional currency of the Trust is the Swiss Franc in accordance with FASB Accounting Standards Codification (ASC) 830, Foreign Currency Translation. For financial statement reporting purposes, USD is the reporting currency. As a result, the financial statements are translated from Swiss Francs to USD. The Closing Spot Rate on the last day of the period is used for translation in the statements of financial condition. The average Closing Spot Rate for the period is used for translation in the statement of income and comprehensive income and the statement of cash flows. Any currency translation adjustment is included in comprehensive income. The Trust is treated as a grantor trust for federal income tax purposes and, therefore, no provision for federal income taxes is required. Interest, gains and losses are passed through to the Shareholders. Shareholders generally will be treated, for U.S. federal income tax purposes, as if they directly owned a pro-rata share of the assets held in the Trust. Shareholders also will be treated as if they directly received their respective pro-rata shares of the Trusts income, if any, and as if they directly incurred their respective pro-rata shares of the Trusts expenses. The acquisition of Shares by a U.S. Shareholder as part of a creation of a Basket will not be a taxable event to the Shareholder. The Sponsors fee accrues daily and is payable monthly. For U.S. federal income tax purposes, an accrual-basis U.S. Shareholder generally will be required to take into account as an expense its allocable share of the USD-equivalent of the amount of the Sponsors fee that is accrued on each day, with such USD-equivalent being determined by the currency exchange rate that is in effect on the respective day. To the extent that the currency exchange rate on the date of payment of the accrued amount of the Sponsors fee differs from the currency exchange rate in effect on the day of accrual, the U.S. Shareholder will recognize a currency gain or loss for U.S. federal income tax purposes. The Trust does not expect to generate taxable income except for gain (if any) upon the sale of Swiss Francs and interest income. A non-U.S. Shareholder generally will not be subject to U.S. federal income tax with respect to gain recognized upon the sale or other disposition of Shares, or upon the sale of Swiss Francs by the Trust, unless: (1) the non-U.S. Shareholder is an individual and is present in the United States for 183 days or more during the taxable year of the sale or other disposition, and the gain is treated as being from United States sources; or (2) the gain is effectively connected with the conduct by the non-U.S. Shareholder of a trade or business in the United States. A non-U.S. Shareholders share of any interest income earned by the Trust generally will not be subject to U.S. federal income tax unless the Shares owned by such non-U.S. Shareholder are effectively connected with the conduct by the non-U.S. Shareholder of a trade or business in the United States. To the extent that the interest earned by the Trust exceeds the sum of the Sponsors fee for the prior month plus other Trust expenses, if any, the Trust will distribute, as a dividend, the excess interest earned in Swiss Francs effective on the first business day of the subsequent month. The Trustee will direct that the excess Swiss Francs be converted into USD at the prevailing market rate and the Trustee will distribute the USD as promptly as practicable to Shareholders on a pro rata basis (in accordance with the number of Shares that they own). 1,400,114 resulting in an ending Swiss Franc principal balance of 378,682,143. This equates to 369,716,518 USD. For the year ended October 31, 2008, there were Swiss Franc principal deposits of 720,000,000 and Swiss Franc principal redemptions of 390,000,000 resulting in an ending Swiss Franc principal balance of 545,000,000. This equates to 467,049,447 USD. For the year ended October 31, 2007, there were Swiss Franc principal deposits of 200,000,000 and Swiss Franc principal redemptions of 15,000,000 resulting in an ending Swiss Franc principal balance of 215,000,000. This equates to 185,520,752 USD. In addition, net interest associated with creation and redemption activity is held in a Swiss Franc-denominated non-interest-bearing account, and any balance is distributed in full as part of the monthly income distributions. Shares are classified as redeemable for financial statement purposes, since they are subject to redemption. Shares are issued and redeemed continuously in Baskets in exchange for Swiss Francs. Individual investors cannot purchase or redeem Shares in direct transactions with the Trust. Only Authorized Participants (as defined below) may place orders to create and redeem Baskets. An Authorized Participant is a participant in The Depository Trust Company (DTC) that is a registered broker-dealer or other institution eligible to settle securities transactions through the book-entry facilities of the DTC and which has entered into a contractual arrangement with the Trust and the Sponsor governing, among other matters, the creation and redemption process. Authorized Participants may redeem their Shares at any time in Baskets. Due to expected continuing creations and redemptions of Baskets and the three-day period for settlement of each creation or redemption, the Trust reflects Shares created as a receivable. Shares redeemed are reflected as a liability on the trade date. Outstanding Shares are reflected at a redemption value, which is the NAV per Share at the period end date. Adjustments to redeemable capital shares at redemption value are recorded against retained earnings, or, in the absence of retained earnings, by charges against the cumulative translation adjustment. The Trustee calculates the Trusts NAV each business day. To calculate the NAV, the Trustee subtracts the Sponsors accrued fee through the previous day from the Swiss Francs held by the Trust (including all unpaid interest accrued through the preceding day) and calculates the value of the Swiss Francs in USD based upon the Closing Spot Rate. If, on a particular evaluation day, the Closing Spot Rate has not been determined and announced by 6:00 PM (London time), then the most recent Closing Spot Rate shall be used to determine the NAV of the Trust unless the Trustee, in consultation with the Sponsor, determines that such price is inappropriate to use as the basis for such valuation. In the event that the Trustee and the Sponsor determine that the most recent Closing Spot Rate is not an appropriate basis for valuation of the Trusts Swiss Francs, they shall determine an alternative basis for such evaluation to be employed by the Trustee. The Trustee also determines the NAV per Share, which equals the NAV of the Trust divided by the number of outstanding Shares. Shares deliverable under a purchase order are considered outstanding for purposes of determining NAV per Share; Shares deliverable under a redemption order are not considered outstanding for this purpose. The Sponsor is a related party of the Trust. The Sponsor oversees the performance of the Trustee and the Trusts principal service providers, including the preparation of financial statements, but does not exercise day-to-day oversight over the Trustee or the Trusts service providers. The Sponsor has paid the costs of the Trusts organization and the initial sales of the Shares, as described in Note 5. Under the Trusts organizational documents, the Sponsor is indemnified against any liability or expense it incurs without negligence, bad faith or willful misconduct on its part. The Trusts maximum exposure under these arrangements is unknown, as this would involve future claims that may be made against the Trust that have not yet occurred. Pursuant to the requirements of Section 13 or 15(d) of the Securities Exchange Act of 1934, the registrant has duly caused this report to be signed on its behalf by the undersigned, thereunto duly authorized in the City of Rockville, State of Maryland, on January 14, 2010. Pursuant to the requirements of the Securities Exchange Act of 1934, this report has been signed below by the following persons on behalf of the registrant and in the capacities* and on the dates indicated. * The registrant is a trust and the persons are signing in their capacities as officers or directors of Rydex Specialized Products LLC, the Sponsor of the registrant.